Painter, part of an Italian family of painters. The family, which originated in Cento, comprised Benedetto Gennari I (1563-1658); his two sons Ercole Gennari (1597-1658) and Bartolommeo Gennari (1594-1661), who married Lucia, the sister of Guercino; Lorenzo Gennari (1595-1665/72), who was descended from another branch of the family; and Ercole s two sons, Cesare Gennari (1637-88) and Benedetto Gennari II. These artists were closely associated with Guercino, and their work, with the exception of that of Benedetto II, has been difficult to identify among the many paintings from Guercino s studio. It seems that neither Ercole nor Lorenzo had an independent career; Bartolommeo, whose style remained close to that of Guercino, had a stronger personality; Cesare, though he too painted very much in Guercino s manner, was the most gifted. These four worked with Guercino in Cento, Lorenzo as his first assistant until 1630, when he left the studio. In 1642 Guercino moved to Bologna, followed in 1643 by Bartolommeo and Ercole, with the latter s family. Bartolommeo, who succeeded Lorenzo as Guercino s assistant, painted some independent works, such as the Incredulity of St Thomas (1643-45, Cento, Pinacoteca Civica). 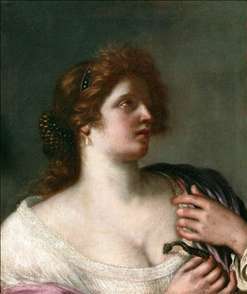 After the death of Guercino, Cesare, with his brother Benedetto II, ran the studio; Cesare s Penitent Magdalene (c. 1662, Cento, Pinacoteca Civica) is characteristic of his accomplished style.